The high level of personal service from CBBI clearly sets us apart from others. 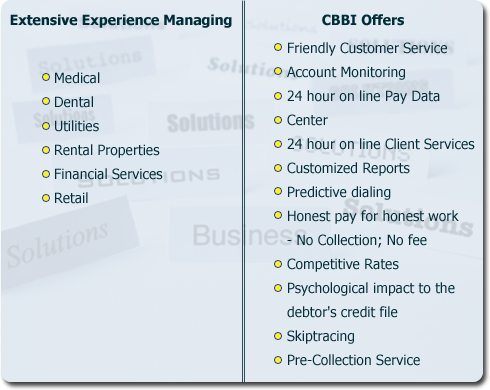 As your collection agency, CBBI puts more than state of the art automation to work covering your accounts. Our success rate is also built on close, ongoing contact; on repeated, systemized follow-thru; and on the total professionalism of our collectors. Our collectors receive continual training in the most effective and up to date methods of collecting accounts. CBBI has highly trained medical collectors that are knowledgeable of insurance policies and filings, HIPAA guidelines, and the FDCPA, and know that excellent patient relations skills are crucial to successful medical debt collection. In addition, every collection assignment is under constant surveillance by a quality control supervisor who reviews and directs accounts when the collector has been unable to effect collection. Our approach, combined with our innovative full service collection system that uses the convenience and speed of the internet to put you in control of your collections 24/7. This technology gives you real-time access to all of your accounts. You will be able to access the current balance, payments made, letters sent, and current status. 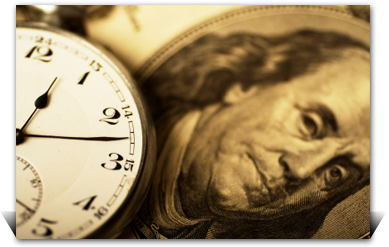 CBBI offers very competitive rate programs backed with our "No Collection, No Fee". We can completely customize a collection service to meet your needs. 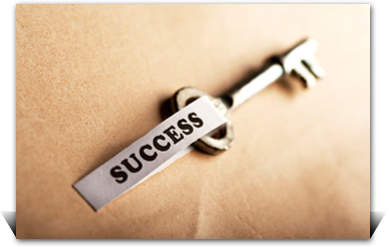 CBBI can make your collection of bad debt more successful. Copyright ©2012 Credit Bureau of Bessemer, Inc. All rights reserved.